Wrapped in Goodness! And Snuggies! 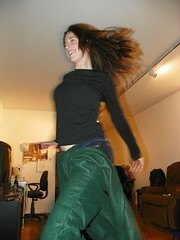 A few weeks ago I received an email titled “Lean Pockets – Hurray!” Hurray (or Hooray!) indeed! 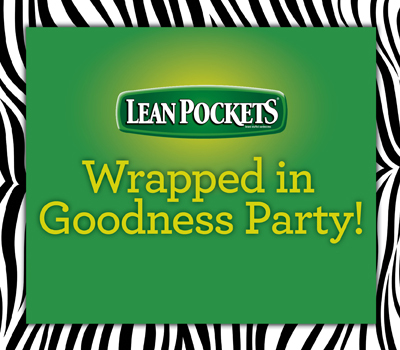 Turns out Lean Pockets wanted me to host a party – a Wrapped in Goodness party. Fast forward to a box so huge I could fit myself into it showing up at my door, filled with free coupons for new Culinary Creations Lean Pockets, a fun game to play, and SNUGGIES. 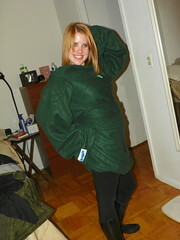 Yes, hunter green Snuggies w/ a cute little Lean Pockets logo. So, I rounded up the troops, my friend Julie graciously hosted so that people wouldn’t have to schlepp out to the Bronx, and Dave and I went on a search for Lean Pockets. (I think we cleaned out the freezer section of our store.) 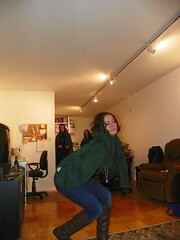 And what happens when you bring together 8 girls, some boyfriends, a husband, Lean Pockets, (and Whipahol and Four Loko)? 10 points if you know the reference. -100 if you don’t. It was seriously the best time ever. Especially with commentary by Julie done in a GREAT Michael Kors voice. We also came up with my Halloween costume for next year. 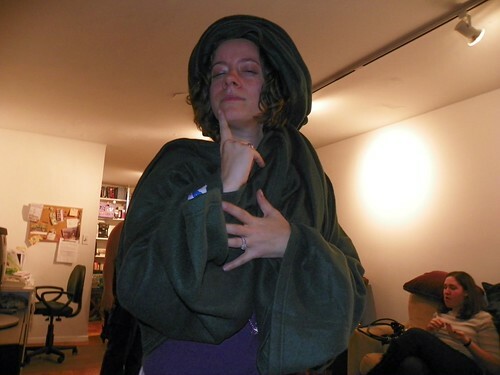 I make a great Professor Quirrell, don’t you think? Is that Voldemort under your headwrap, or are you just happy to see me? 1 – comment. That’s all, just comment. Tell me your favorite Lean Pocket flavor, your favorite color, your favorite group on The Sing Off, etc. 2 – for an extra entry, become a fan of Lean Pockets on Facebook —-> right over here. And then leave a 2nd comment letting me know you did so. Giveaway will end next Wednesday, December 15 at 11:59pm EST. 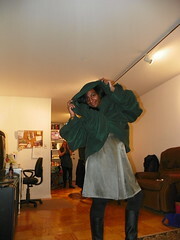 Disclosure: Lean Pockets provided me with coupons for free Lean Pockets to serve my guests at my partay, as well as for the giveaway, in addition to the super awesome snuggies. I was also given VISA gift cards to shop for the party, and as a thank you. And as usual, the opinions? They is my own. Word. Now I feel like I needa lean pocket for lunch! I am pretty sure that if I supplied my boyfriend with a year of Lean Pockets, that by the end of the year, I would be married. OMG yum!! I always go for one of my favorites – pepperoni pizza!!! Mmmm. And I "liked" on FB too!! that is a lot of pockets! I like the meatball and mozzarella ones, though I haven't had them in a million years! I love lean pockets! Pepperoni and meatball are my favorites. And I liked on FB as well! A year's supply of Lean Pockets… holy hell that sounds like heaven! The breakfast ones… and the chicken artichoke ones… and the pepperoni ones…. and and and….YUM! a year's supply? that's intense. 🙂 i like… broccoli/cheese. is that a lean pocket flavor? i know it's a hot pocket flavor. Um, this looks like SO MUCH FUN. Who'd have thought that Lean Pockets could make for such fun party? I often think of Jim Gaffigan when I think of Lean Pockets, but I can't help loving them just the same. They're too darn delicious. my favorite movie EVER is ZOOLANDER!!!! and i am freaking pumped that they are making a second. aaaaand i liked it on facebook. lean pockets ftw! should i have made that two comments? i liked it on facebook…and now i want one. i love committed! (and this coming from the little jewish girl says a lot)…i think i love them because a) i love shawn stockman and b) they are just like boys ii men part 2 and nothing says melting away with love over singing black men! mmmm ham and cheese!!!!! gimme! You had me at free food for a year. oh my god your walk off is amazing, seriously i LOVE it. so much fun. YESSSSSSS. We are the coolest people I know. Especially me. I AM SO FIERCE. I can't say that I buy Lean Pockets that often, but I'm pretty sure if I had access to a year's supply I would probably stock up! but i did friend lean pockets… because i love those freakin' things. Also if I win a years worth of lean pockets i think my husband will die… its sad trade off. Hilarious! I love that you had a walk off!!! I'd probably want to try the Culinary Creations – Chipotle Chicken. I like the Philly STeak & Cheese. YUM! It's a mother effing walkoff! YES! I LOVE IT. And I love your Quirrell! I'm basically obsessed with this whole post. A year of lean pockets? Yes!! Fave Sing Off group: Street Corner Symphony. Also– fanned them on FB! Hurray! I haven't had lean pockets in forever but I love them so much and used to live off them when I worked at an office all the time. I don't know that I have a favorite because they're all pretty damn delicious. Favorite lean pocket would be a classic… pepperoni pizza. Loving the snuggie walk off. A whole year of Lean Pockets would def cut my grocery bill in half! My fiance and I eat those about 5 times a week! Not because we are lazy.. because we love them! My favorite flavor right now is the NEW chicken Bacon dijion! Had it for dinner last night. It is to die for! 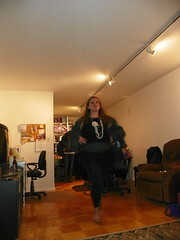 Right now my favorite thing is a snuggie walk-off! Brilliant! 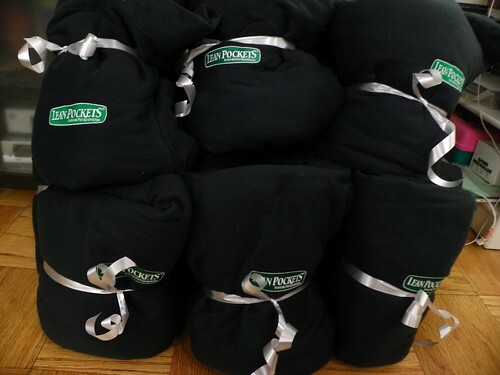 Thanks for hosting the giveaway – my favorite lean pocket has to be the italian meatball one. i am drooling just thinking about it. I also liked Lean Pockets on facebook!